You are here: Home>Archive>First World War Collection>WW1 Medals and ribbons awarded to Harold Godwin>World War One Victory medal ribbon awarded to 4th Class Artificer Harold Godwin. World War One Victory medal ribbon awarded to 4th Class Artificer Harold Godwin. 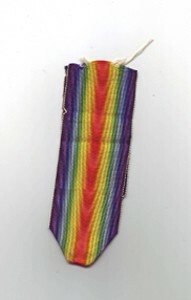 Ribbon from a Victory Medal. It consists of a two rainbow design with violet on the outside edges moving to red in the centre.